There are cases where birds are considered pests. If so you may need a sonic repeller. 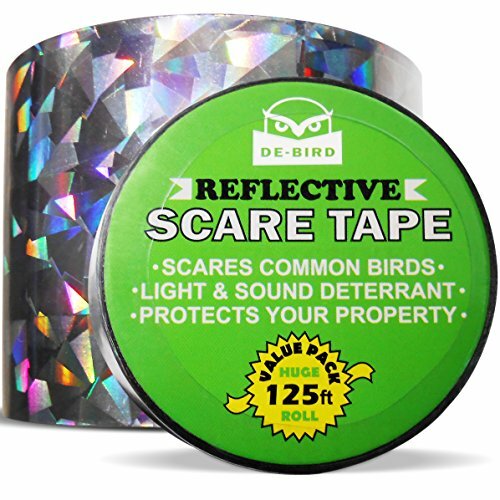 Comes with the General/Agricultural chip that repels European starlings, American robins, house finches, ring-billed gulls, common grackles, blue jays and red winged blackbirds. See our other products for more chips or contact us for customization. The Bird Gard Pro is best for applications with up to 1.5 acre coverage. The built in amplifier and speaker are durable and the unit easily mounts to a fence or post courtesy of the included mounting bracket. System includes: Sound generating device with speaker built in; Power adapter plus 50′ cable; Enclosure is weatherproof; Bracket for mounting. Repel targeted birds from crops, buildings, airports – anywhere birds are a nuisance. Bird Gard’s products are based on the premise that there are certain sounds, or combinations of sounds, that act as a natural repellent and will drive away unwanted or dangerous birds. 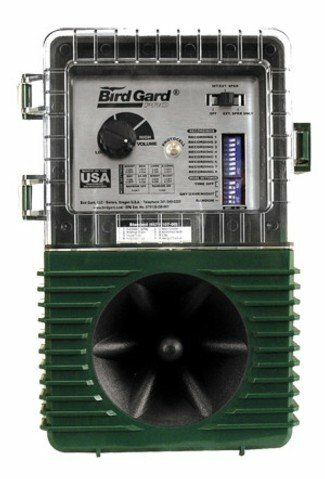 Bird Gard products use digital quality recordings of actual bird distress and predator calls and annoying electronic harassment sounds to repel birds by creating a hostile environment where the birds feel threatened and uncomfortable. These sounds are broadcast by a microprocessor and output through high-fidelity speakers. The sounds will not degrade over time since they are all digital recordings. Each bird repelling system features multiple sounds that are fully selectable and programmable for customized operation. Each unit incorporates a random mode that plays the selected sounds in a random order at a random frequency and then remains silent for a random length of time before playing the sounds again in a different order. All of this is done to keep the birds from becoming accustomed to hearing the same sounds at the same time intervals. All units (except the Super Pro AMP) can be powered by AC current or a 12-volt battery (which can be charged by an optional solar panel). Frequency Range 2,000 – 10,000 Hz. UL/CUL/CE Listed. EPA Establishment #075130-OR-001. Comes with one built in speaker and repels birds in a space up to 1.5 acres. The built in amplifier and speaker are durable and the unit easily mounts to a fence or post courtesy of the included mounting bracket. Comes with a chip to repel European starlings, American robins, house finches, ring-billed gulls, common grackles, blue jays and red winged blackbirds. Repel targeted birds from crops, buildings, airports – anywhere birds are a nuisance. > Organic Food – grow some in your yard!